We’re excited to be pouring our Malted Milkshake IPA, Amber, Session and Session Light at the Hop Jam Beer and Music Festival in Tulsa, OK. 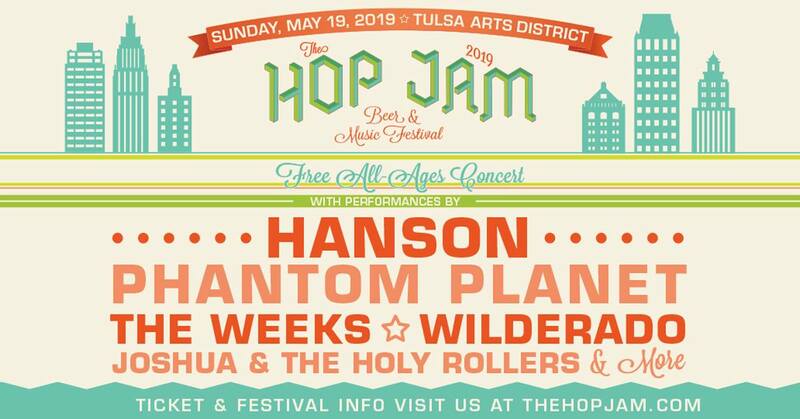 The concert will be lead by festival founders HANSON, returning to the Hop Jam stage after a world tour, a much anticipated reuniting of indie rock powerhouse Phantom Planet, Southern rock outfit The Weeks, Tulsa’s own Wilderado, and Joshua and The Holy Rollers helmed by fourth Hanson brother Mac Hanson. The craft beer portion of The Hop Jam is set to impress and excite new and old beer fans once more with an extensive list of new breweries and returning favorites from across OK, the US and more, including Full Sail, Lagunitas, American Solera, Hanson Brothers Beer, Ommegang, Marshall, COOP, Toppling Goliath, Franconia, Oscar Blues and many more, along with many more landmark brands making up the over 100 anticipated participating breweries. We hope to see you at The Hop Jam 2019.